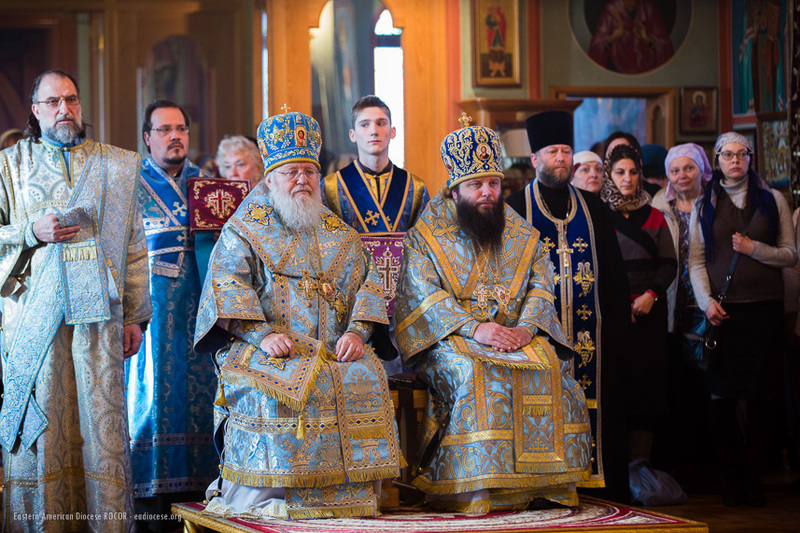 Celebrating the festal Divine Liturgy was Metropolitan Hilarion of Eastern America & New York, First Hierarch of the Russian Church Abroad. His Eminence as co-served by diocesan vicar Bishop Nicholas of Manhattan, and clergy of the Diocese and Patriarchal Parishes in the USA. The divine services were conducted under the aegis of the Protectress of the Russian Diaspora: the Kursk Root Icon of the Mother of God. Prior to the start of Liturgy, cathedral cleric Reader Peter Lukianov was ordained a subdeacon, while altar server Aleksei Roschko was awarded the right to wear the orarion. Before the communion of the faithful, Archpriest Victor Potapov, rector of St. John the Baptist Cathedral in Washington, DC, addressed the gathered worshipers with a sermon. Fr. Victor spoke about the history of the radiant feast of the Entrance into the Temple of the Most Holy Theotokos, reminding the Orthodox that “this day calls to mind for us not only of the childhood of the Most Holy Theotokos, but also the significance of raising our children and grandchildren in church, because there is no better place for children than the House of God.” “If we will instruct our children from infancy, if we will overcome our spiritual indolence and bring them to church; if from their mother’s breast they will be accustomed to regularly commune of Christ’s Holy Mysteries, then this will be the surest defense for the next generation against the pernicious influences of this world. And even if they later fall from the path, rest assured that the seeds sown in their infancy will make themselves known later in their lives,” concluded Fr. Victor. 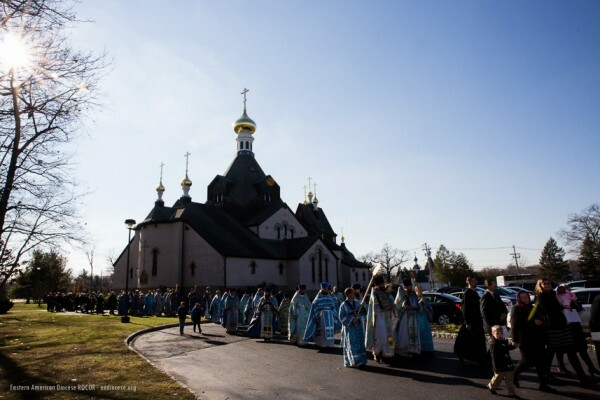 Upon completion of the divine services, the bishops, clergy, and faithful undertook a procession with the Kursk Root Icon from the cathedral to the monument the Reunification of the Russian Orthodox Church. 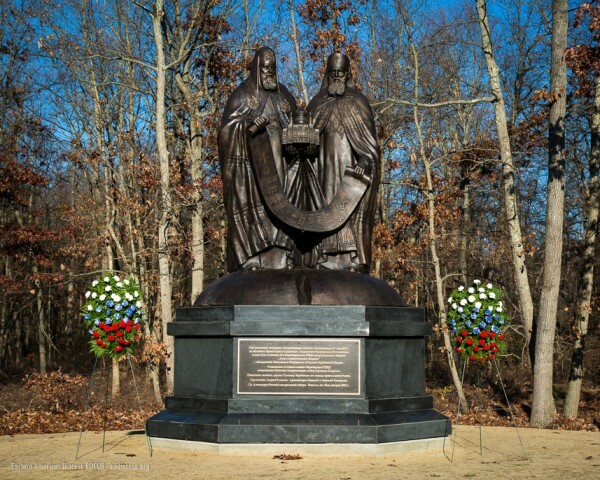 The name of the new monument, “Reunification,” expresses the core content of the idea inlaid in the sculpture: the memory of the historic event that ended the period of tragic division in the Russian Church in the 20th century – the May 17, 2007 signing of the Act of Canonical Communion between the Russian Orthodox Church Outside of Russia and the Russian Church in the homeland. Imprinted in bronze are the figures of Patriarch Alexey II and Metropolitan Laurus, holding in their hands Christ the Savior Cathedral. The monument’s sculptor is Andrey Klykov, and the project’s architects are Gennady and Anatoly Kuznetsov. 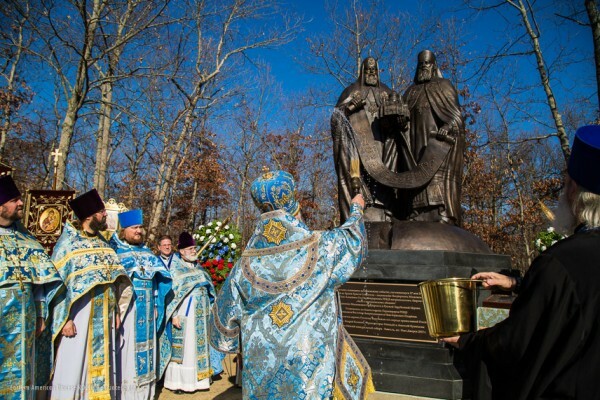 As the plaque on the plinth bears witness, the monument is “a gift to the Russian Diaspora from the people of Orthodox Russia.” Symbolically, a nearly identical monument was installed on the territory of the Nativity of the Mother of God “Kursk Root Hermitage” in the Kursk Diocese. The only difference between the two is that, in the Kursk monument, the two primates are holding the Kursk Root Icon of the Mother of God, while in the American monument, they are holding Christ the Savior Cathedral. Opening the ceremony of the blessing of the monument, Metropolitan Hilarion, First Hierarch of the Russian Church Abroad, called the sculpture “a remarkable memorial to two remarkable men.” “Today, we dedicate in the American land a monument to a great event in the life of the United Russian Orthodox Church. 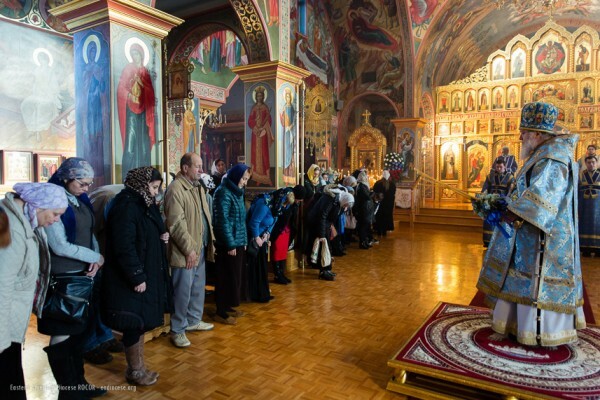 For more than half a century, our Russian people, bound by a common Faith, were deprived of the ability to pray together at God’s Altar or to commune from One Chalice. Time and ceaseless prayer were needed for the restoration of Church unity. Eight years ago, these divisions were wiped away. On the day of the signing of the Act of Canonical Communion, a new world of the fullness of Orthodoxy and brotherly unity opened for millions of Russian people on every continent. The question of reuniting the Russian Church depended greatly on two men, who piloted the Ark of Salvation – the Church – in those years: the Most Holy Patriarch Alexey II and Metropolitan Laurus. They both accomplished the greatest feat of their lives, fulfilling the will of God and their historic destiny,” noted His Eminence. He called on the clergy and faithful to commemorate and thank the ever-memorable primates for their labors in reuniting the two branches of the Russian Church. Also taking part in the ceremony of the blessing of the monument were the Consul General of the Russian Federation in New York City, Igor Golubovsky, a delegation from Kursk led by deputy Vladimir Kharin of the Regional Duma, and members of the Kuban Cossack Voisko. “Today we saw a long-awaited event that had to happen in the American land,” said the Consul General of the Russian Federation Igor Golubovsky, addressing those gathered. “This monument is not only a memorial to the Reunification that took place eight years ago, but also a spiritual unity of parts of sacred Moscow with the bearers of the Russian spirit and Russian culture, who by the will of fate have found themselves outside of Russia. I look at this monument, at the figures of these two visionary men, and I see that their gaze is directed toward the future. The great deed that they accomplished was done not only for us, but for future generations.” On behalf of the Russian ambassador, Sergey I. Kislyak, members of Russia’s diplomatic corps in America, and himself, Golubovsky thanked all those who dedicated even a small portion of their labors toward the installation of the monument to the Reunification. 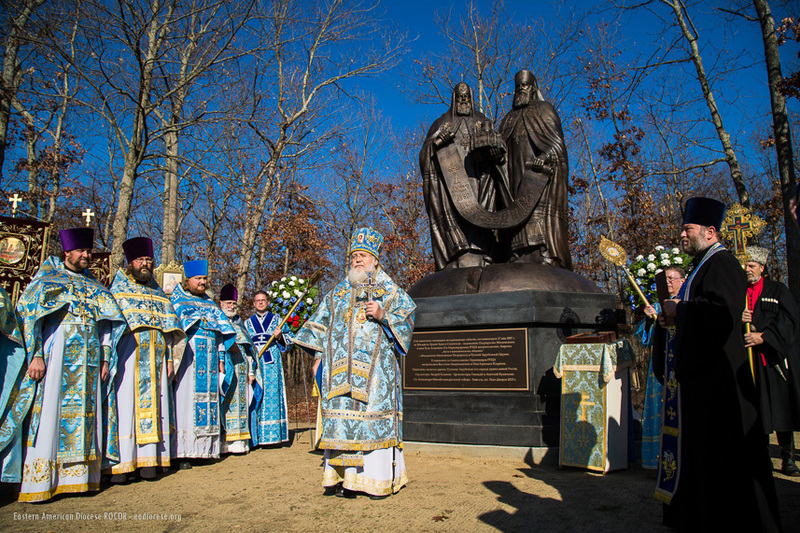 Metropolitan Hilarion also addressed words of thanks to those who labored to design and complete the sculpture. Architect Anatoly Kuznetsov, director of the “Tserkov’” Fund, thanks to whom the idea of the monument was brought to life, was awarded the Russian Church Abroad’s highest honor: the Order of the Kursk Root Icon, 1st Class. Diocesan gramotas were awarded to the sculptor, Evgeny Korolev, to Kursk Duma deputy Vladimir Kharin, and to Valery Balakirev. The Russian guests will relay the remaining gramotas to those awarded who were not able to attend. “In the five years during which we were developing this monument, it became dear to us, and we wanted to give it into good hands,” said sculptor Evgeny Korolev. “Here, in America, we saw how the Russian people approach the Orthodox Faith with trepidation, and we were very glad to see the monument put in its rightful place.” Korolev expressed particular words of thanks to Metropolitan Hilarion, who during the development of the sculpture found the time to come to the workshop and support those who were laboring to create the monument.